The Lost Index: NATMUS is the latest in a series of locative iPhone apps produced by James Brocklehurst and Emma Whittaker. 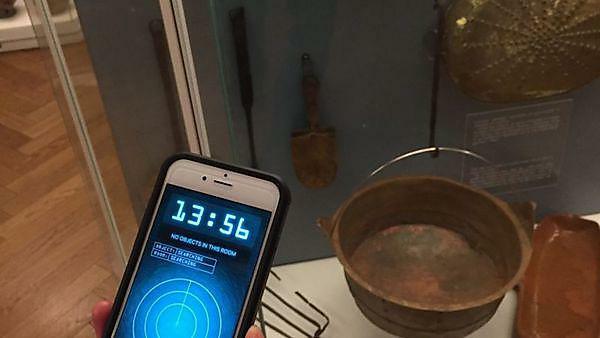 Sited within museums, the apps incorporate iBeacon technology, binaural sound recordings and perceptual illusions, in conjunction with real-world artefacts from the museum’s collections, to create imaginary playable experiences. Forming part of research that investigates situated narrative experiences, the apps offer new narrative frameworks and an innovative approach to archive and heritage interpretation. Commensurate with Arts Council England’s (Arts Council England 2013: 25, 26, 30) strategic aims to support the development of new artistic forms and experiences, and for museums to have a breadth of engagement and use digital technologies to reach new audiences, this research explores the notion that collections, together with their spaces of display, can become ‘sites of possibility’ for creative re-interpretation. NATMUS was installed in the Dieselhouse Museum and National Museum of Denmark in Copenhagen as part of the 8th International Conference on Interactive Digital Storytelling in November 2015. Findings from the research were presented at the annual National Archives and Research Libraries UK conference ‘Discovering Collections, Discovering Communities’ in Salford, October 2016. James Brocklehurst is a lecturer in Graphic Communication at Plymouth University. Emma Whittaker is a post-doctoral research fellow in Ambient Literature at the University of the West of England.